Hiroyuki Aihara, MD, PhD from Brigham and Women’s Hospital in Boston, Massachusetts, USA discusses his Original Article “Facilitating endoscopic submucosal dissection: the suture-pulley method significantly improves procedure time and minimizes technical difficulty compared with conventional technique: an ex vivo study (with video)” from the September issue. The main purpose of this study was to objectively analyze the efficacy of the “suture-pulley” method for endoscopic submucosal dissection (ESD). In this method, an endoscopic suturing device, which allows placement of a 3-0 polypropylene suture with a detachable anchor, facilitates countertraction during ESD. In ESD, endoscopists frequently experience difficulty maintaining direct visualization of the submucosal dissection layer. ESD has been performed by utilizing a transparent hood and gravity to visualize the dissection plane. However, this aspect of ESD requires substantial training and experience, and thus has resulted in blind dissection, unexpected bleeding, perforation, and longer procedure time. Figure 3. Efficacy of the suture-pulley method. A, 3-cm gastric lesion was simulated by marking dots in the upper stomach. B, The circumferential incision was completed. C, The suture pulley provided direct vision of the submucosal dissection plane at the initiation of submucosal dissection. D, Traction force was effective until submucosal dissection was completed. In order to objectively evaluate the potential advantage of the novel suture-pulley technique over conventional ESD, 30mm gastric lesions were simulated in porcine stomachs by using a circular template and marking dots (10 lesions in each group, at specific locations in the stomach). Time was recorded separately for the circumferential incision, suture-pulley placement, and submucosal dissection. The median total procedure time with the suture-pulley method was significantly shorter than the traditional ESD technique (531 vs 845 seconds, P< .001). Although we observed a significantly longer procedure time for proximal versus middle/lower gastric lesions with traditional ESD (1601 vs 663 seconds, P<.01), there was no significant difference in procedure time between lesions at various locations when using the suture-pulley method. 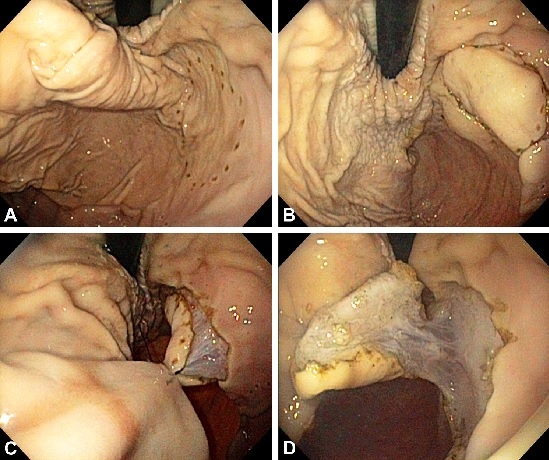 This study demonstrates that the suture-pulley method provides the endoscopist with direct visualization of the submucosal dissection line throughout the procedure, which is essential to avoid adverse events such as perforation and bleeding. This technique also results in a significant reduction in ESD time and improves efficiency. The suture-pulley method is effective even for lesions in difficult locations, lessening lesion location as a complicating factor for ESD. Further clinical study is warranted.